Ballot for the 1938 German Reichstag election. There is a large circle in the center for a "yes" vote, and a much smaller circle on the right for a "no" vote. Making a flip Nazi comparison is a sure way to get yourself in hot water, and sure enough, the former World Series MVP was quickly met with a backlash. He quickly deleted the tweet and apologized for exercising poor judgement, but the damage was done. Numerous people had already pointed out that comparing Islam to the Nazis is as simple-minded as making the same comparison to Christians—i.e., just because Hitler was a baptized Catholic and wrote that by persecuting Jews he was “fighting for the Lord,” doesn’t mean that everyone holding a Bible is a fascist. The argument against the first part of Schilling’s tweet is ably made here, here, and here, but let’s use the tweet as a good excuse to examine the second part. How could the Nazi's have taken control of all of Germany with only 7% support in 1940? What was their game plan? Going to the #s, per Schilling’s suggestion, here's how Adolf Hitler's National Socialist German Worker's Party (the Nazis) fared in the German Reichstag elections. 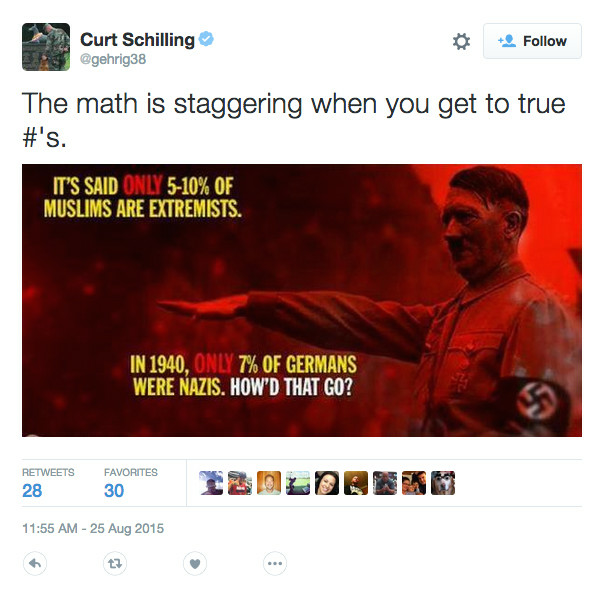 Right away, the Schilling tweet takes a pretty bad hit. Nazi support eclipsed 7% sometime between the 1928 and 1930 elections. Regardless of that fact, its still alarming to see how quickly Nazi support grew in that short amount of time. The explanation is chiefly thanks to the outbreak of the Great Depression that toppled world economies in 1929. German unemployment skyrocketed, while burdensome reparation payments due to the Treaty of Versailles meant that the little money Germany had went overseas to pay off France, Britain, and the United States. Hitler was able to galvanize the German people's frustration with the political establishment using textbook populism. He promised to get every German woman a husband, and give "food and bread" to anyone willing to work for it. He promised to renege on the terms of the treaty and stop sending money overseas. He also said that Communists and Jews were to blame for the depression, and that he would get rid of them if he was elected. However, what helped Hitler almost as much as the chaos of the Great Depression was that Germany had literally dozens of political parties jockeying for power. With so many parties, the German government was crippled and completely unable to find a way to deal with its problems (which exacerbated the crisis and led to frustrated voters seeking even more parties). These fringe parties were often regionally based or single issue parties. They also often had silly names (The Unemployed Front, the Black-White-Red Struggle Front, and the Greater German Middle Class Party for Middle Class Dictatorship), and they usually picked up a few thousand votes each, preventing any one party from receiving a mandate to lead the country. With his second election win, Hitler was named Chancellor by President Paul von Hindenburg. However at this point, many Nazi opponents saw that Hitler's party had lost some of its seats from the last election. His hold on seats in the Reichstag had dropped 4%. Perhaps the Nazis had peaked and Hitler would be unable to keep his supporters once he was actually in charge and had no one else to blame for the country's woes. Hindsight being 20/20, these critics had no idea what was about to happen. Six days before the next Reichstag election, an arsonist set the capital building on fire. Hitler seized the moment and declared that the fire was the work of the Communists and Jews that he had always been warning the country against. A 24-year-old communist laborer was beheaded for the crime, but most historians agree that the plot was actually the work of Hitler himself. In any case, the act of terrorism gave Hitler just the chance he needed to solidify power. The Reichstag Fire Decree gave Chancellor Hitler emergency powers under the constitution, and he used them zealously. He outlawed most rival political parties and arrested the Communist political leaders. The next year's election shows how much it helped the Nazi cause. With the Communists out of the way, Hitler issued the Enabling Act only weeks after the election. This amendment to the constitution formalized his dictatorship by giving him the control to make law without the consent of the Reichstag. The only member of the opposition that dared speak out against the act was the Social Democrat leader Otto Wels. He pointed his finger at Hitler and said, "freedom and life can be taken from us, but not our honor." Shortly after the Enabling Act passed, Wels fled the country and was stripped of his citizenship. Hitler continued the ceremonial act of holding elections until 1938, but as the numbers tell us, there's not a lot of competition when there is only one legal political party in an election. The picture above shows a ballot from 1938. As you can see, there is a big circle under "Ya" for a voter to elect Hitler's rule, and a smaller "Nein" circle if you'd rather not. Way back in July,1932, Hitler was able to claim a democratic victory despite having only 37% of the vote. Had there been only one or two political parties, this never would have been enough to take power. History provides us with the perfect case study of this fact, because in the same year that Hitler's party won their first Reichstag election, Hitler himself lost the Presidential election. You can see that in both cases, Hitler receives 37% of the vote, but President von Hindenburg's 53% easily dominates Hitler in the Presidential contest. So, do we blame the multi-party system for Hitler's reign of terror? If the Germans had outlawed more political parties in 1932, might they have have prevented themselves from being taken over by a tyrant? Blaming the game of ballotball seems just as short-sighted as comparing Muslims to Nazis. Lots of countries have multi-party systems and they've produced just as many Winston Churchills as they have Adolf Hitlers. History is a complicated web that needs to be understood on its own terms and should almost never be reduced to the size of a tweet. However, if you are looking for something to compare the Nazis to, how about we try other Nazis? Come back next week for our examination of several contemporary Neo-Nazi, Islamaphobic, and anti-Semitic political parties in Europe that have well over 7% of the public's support. Somebody ought to tweet about that.